E. van Binnebeke, Bronze sculpture: Sculpture from 1500-1800 in the Collection of the Bojmans-van Beuningen Museum, Rotterdam, 1994, pp, 132-33, no. 38. 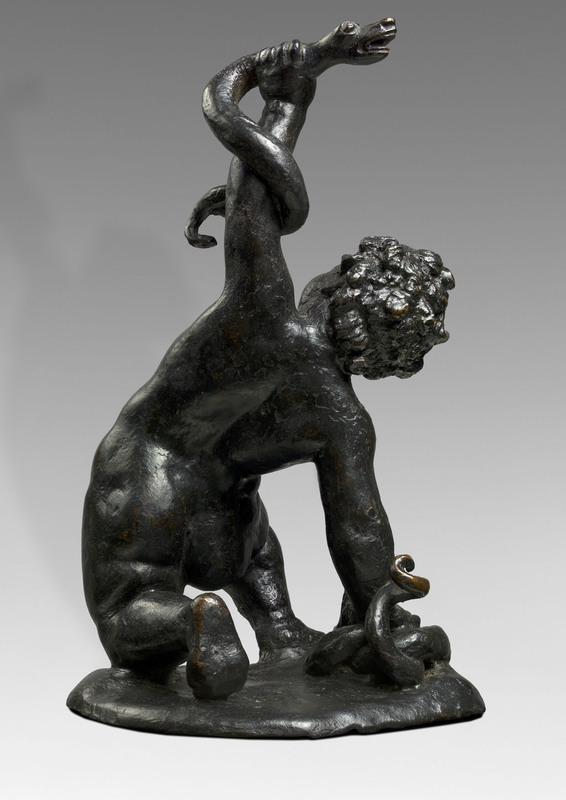 V. Avery, J. Dillon, Renaissance and Baroque Bronzes from the Fitzwilliam Museum, Cambridge, London, 2002, pp. 168-71 and 271-73. Modelled to be appreciated from different viewpoints, the source of inspiration for the present composition can be traced back to the Hellenistic marbles of the Laocoon (Vatican, Belvedere Courtyard from 1506) and the Hercules Killing a Snake (Tribuna degli Uffizi, from 1589). The attribution of the model to Francesco Fanelli was first proposed by Charles Avery and Anthony Radcliffe for the cast formerly in the collection of Baron Hatvany. This is strongly supported by a “Design for a Fountain with the Infant Hercules” in Fanelli’s Varie Architetture (Antwerp, n.d.), related to the sculptor’s involvement in the Italianate gardens for Queen Henrietta-Maria’s new palace at Wimbledon, begun in 1639. The bronze can moreover be compared with a Sleeping Cupid, ca. 1635-40, signed by Fanelli in the Victoria and Albert Museum, London (inv. no. A.2&2-1981). Fanelli was born in Florence and worked in Genoa before coming to England around 1630, where he was chiefly employed by King Charles I and where he is thought to have remained until the outbreak of the Civil War. Other known bronzes by him include a Cupid on a Leaping Horse and a relief of the Holy Family and the Miraculous Cure of the Robber’s Child (Fitzwilliam Museum, Cambridge), as well as a bust of the king (Victoria and Albert Museum). Other versions of Fanelli’s Hercules are in the Fitzwilliam Museum, Cambridge (fig. 1), the Kunsthistorisches Museum, Vienna, and the Museum Bojmans-van Beuningen, Rotterdam. 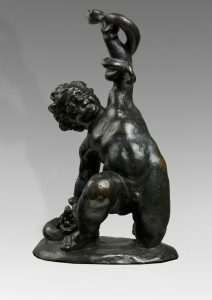 The patina on the present bronze is suggestive of a Northeast Italian origin.